The best stay-and-play havens have it all, but first and foremost, they offer a pinch-me level of fairways and greens so perfect players’ greatest challenge is coping with giddy distraction. Beyond the gawk-worthy golf itself, high-quality golf resorts need to offer refined food and beverage choices alongside a wide variety of après golf amenities and enticements. A well-stocked pro shop, free practice balls, and GPS-enabled cars are just amuse-bouches in the feast these resorts provide. 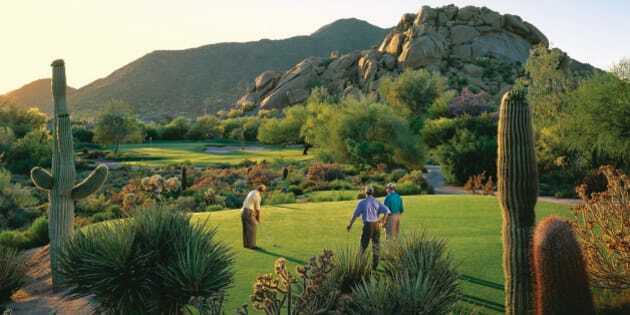 The golf resorts on this list don't just strive to shoot for par. They aim to exceed even the most stubbornly high expectation of visiting players. Whether you’re seeking a pins & fins holiday on the coast, a few guys gambling and golf weekend in Vegas, or searching some sensational rounds on top-flight courses along with plush accommodations, this list has you covered.